Meet Big Daddy Love & Copious Jones! 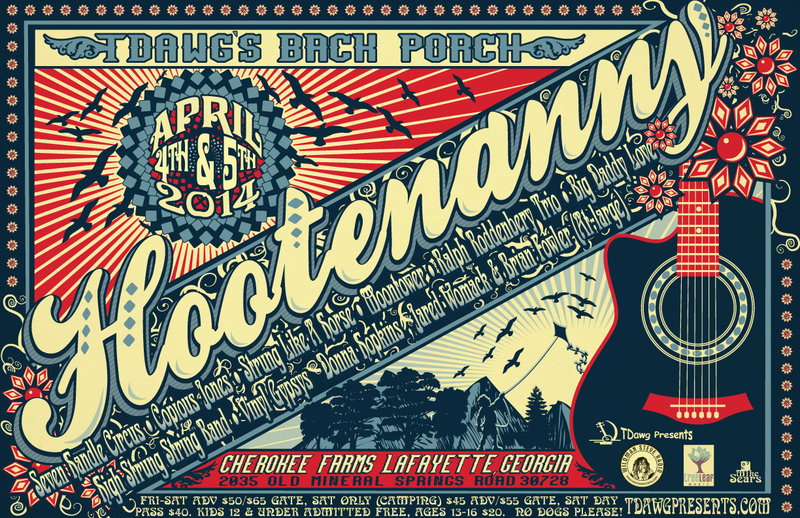 This spring’s 16th Edition of TDawg’s Back Porch Hootenanny has a blueprint for absolute magical music mayhem, and the two bands in this posting – Copious Jones & Big Daddy Love – embody that quality equally as much as Seven Handle Circus and Moontower! Friday night Hootenanny headliner Big Daddy Love is a Winston Salem, NC-based quintet that really will “rock your world”. Their brand of music, aptly titled “Appalachian Rock”, ties together the elements that make their sound unique – rock, roots and bluegrass – and the end result is a sound that has you stompin’ up a storm to some mighty fine pickin’ & grinnin’, BDL style! Their set up is like a southern rock band, with interplay between slide and acoustic guitar and a banjo sound that lends itself toward Earl Scruggs & Bela Fleck, and the rhythm section keeps you jumpin’! BDL has had the good fortune to open for music icons Willie Nelson and Bob Seger, and they had those audiences shouting for more. As organic as it gets, playing off their varied musical influences to produce a sound all their own, Big Daddy Love is going to tear it apart at the Hootenanny!! The video below is from their set opening for Bob Seger at PNC Arena in Raleigh. Enjoy! TDawg Presents is excited as can be to welcome back Copious Jones to the Hootenanny mix! This diverse six-piece based out of Atlanta brings quite an array of musical styles into the mix, including jazz, latin, rock, funk, African, folk and blues. Combining these elements into one sound creates an energy that is Copious Jones, led by the talented song-writer Mikhael Peterson. A fine mixture of youth and well-seasoned veterans of the music scene, Copious Jones has evolved from a bar band playing around Atlanta into a highly regarded regional act. They have earned the praise of both fans and industry folk, including notables like the legendary keyboardist Chuck Leavell and Rob Barraco of Phil Lesh & Friends fame. These fellas have the medicine to satisfy your musical needs, so be ready to be taken away at the Hootenanny! The video below is from the recent performance at the Variety Playhouse in Atlanta opening for The Grapes. What a night! Support the Hootenanny and get your tickets early! ← Meet Seven Handle Circus & Moontower!